It combines many of the characteristics found in a pure racing material like the DS2500/3000 (high friction, absence of fade) but has improved cold performance, and reduced disc wear and noise. The key features of DS Performance are. 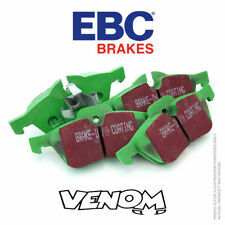 DP21295 EBC GreenStuff Front Brake Pads Toyota MR2. EBC Part Code: DP21295. EBC GreenStuff Front Brake Pads. There is no such thing as a no dust pad and all brake pads create more dust as they are bedding-in especially if brake discs are worn. DP41657R EBC YellowStuff Front Brake Pads Toyota Land Cruiser. EBC Part Code: DP41657R. Toyota Land Cruiser 4.2 TD (HDJ100). EBC YellowStuff Front Brake Pads. This is not a low dust pad. 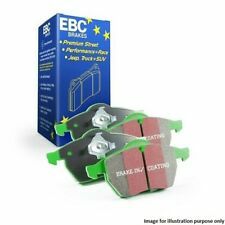 DP2453 EBC GreenStuff Front Brake Pads Toyota MR2. EBC Part Code: DP2453. Toyota MR2 1.6 (AW11). EBC GreenStuff Front Brake Pads. There is no such thing as a no dust pad and all brake pads create more dust as they are bedding-in especially if brake discs are worn. Even up to truck weights these pads grip and do not heat fade! Toyota MR2 Mk3 1.8 - Years of manufacture 2000 > 07. EBC Part Number = DP41295R. - Zero brake fade makes this material perfect for fastest driving. CODICE : FCP1639H - DS2500. CODE : FCP1639H - DS2500. CODIGO : FCP1639H - DS2500. 100A-FCP1639H PLAQUETTES DE FREIN FERODO RACING DS2500 TOYOTA GT-86 2.0 L. 100A-FCP1639H PASTILLAS DE FRENO FERODO RACING DS2500 TOYOTA GT-86 2.0 L.
Bluestuff NDX is a high friction sport and race pad. Toyota MR2 Mk3 1.8 - Years of manufacture 2000 > 07. EBC Part Number = DP51295NDX. We will always help you to have a 100% positive happy buying experience. DP4629R EBC YellowStuff Rear Brake Pads Toyota Levin. EBC Part Code: DP4629R. Toyota Levin 1.6 (AE101). EBC YellowStuff Rear Brake Pads. This is not a low dust pad. Toyota Celica 2.0 GT (ST202). PD13KR393 EBC Rear Brake Kit (GD Discs & YellowStuff Pads) Toyota Celica. EBC Rear Brake Kit (GD Discs & YellowStuff Pads). EBC Part Code: PD13KR393. Contents: Full Rear Axle Brake Kit [Discs & Pads]. DP4725R EBC YellowStuff Front Brake Pads Toyota Celica. EBC Part Code: DP4725R. Toyota Celica 2.0 Turbo GT4 (ST185). EBC YellowStuff Front Brake Pads. This is not a low dust pad. Toyota Land Cruiser 4.2 D (HZJ75). PD03KF1152 EBC Front Brake Kit (Standard Discs & YellowStuff Pads Toyota Land Cruiser. EBC Front Brake Kit (Standard Discs & YellowStuff Pads. EBC Part Code: PD03KF1152. ). DP532 EBC Ultimax Front Brake Pads Toyota Corolla. EBC Part Code: DP532. Toyota Corolla 1.6 Coupe (AE86). Perfect for the driver that wants a top quality alternative to a factory brake pad. 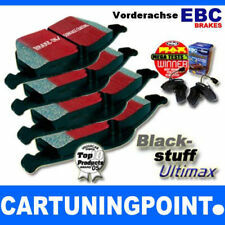 EBC Ultimax Front Brake Pads. DP41295R EBC YellowStuff Front Brake Pads Toyota Yaris. EBC Part Code: DP41295R. Toyota Yaris 1.5 (NCP13). EBC YellowStuff Front Brake Pads. This is not a low dust pad. DP41282R EBC YellowStuff Rear Brake Pads Toyota Land Cruiser. EBC Part Code: DP41282R. Toyota Land Cruiser 4.2 TD (HDJ100). 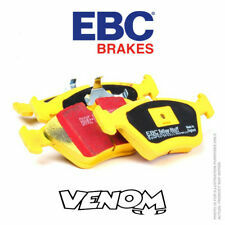 EBC YellowStuff Rear Brake Pads. This is not a low dust pad. Toyota Land Cruiser 3.0 TD (KDJ120). PD03KR698 EBC Rear Brake Kit (Standard Discs & YellowStuff Pads) Toyota Land Cruiser. EBC Rear Brake Kit (Standard Discs & YellowStuff Pads). EBC Part Code: PD03KR698. Toyota Landcruiser 4.2 D (HZJ79) - Years of manufacture 99 > 06. Bluestuff NDX is a high friction sport and race pad. EBC Part Number = DP51319NDX. We will always help you to have a 100% positive happy buying experience. Toyota Land Cruiser 4.2 D (HZJ75). DP6807 EBC GreenStuff Front Brake Pads Toyota Land Cruiser. EBC Part Code: DP6807. EBC GreenStuff Front Brake Pads. There is no such thing as a no dust pad and all brake pads create more dust as they are bedding-in especially if brake discs are worn. Toyota Landcruiser 4.2 TD (HDJ80) - Years of manufacture 92 > 98. Even up to truck weights these pads grip and do not heat fade! EBC Part Number = DP4992R. - Zero brake fade makes this material perfect for fastest driving. Toyota Land Cruiser 4.2 D (HZJ75). PDKF1974 EBC Front Brake Kit (Standard Discs & Ultimax Pads) Toyota Land Cruiser. EBC Front Brake Kit (Standard Discs & Ultimax Pads). EBC Part Code: PDKF1974. Contents: Full Front Axle Brake Kit [Discs & Pads]. Toyota Land Cruiser 4.2 D (HZJ73). PDKF1974 EBC Front Brake Kit (Standard Discs & Ultimax Pads) Toyota Land Cruiser. EBC Front Brake Kit (Standard Discs & Ultimax Pads). EBC Part Code: PDKF1974. Contents: Full Front Axle Brake Kit [Discs & Pads]. FERODO RACING FCP1395H DS composé 2500 Plaquettes Frein Avant Subaru/Toyota. PDKF1966 EBC Front Brake Kit (Standard Discs & Ultimax Pads) Toyota Previa. Toyota Previa 2.4. EBC Front Brake Kit (Standard Discs & Ultimax Pads). EBC Part Code: PDKF1966. Contents: Full Front Axle Brake Kit [Discs & Pads]. DP1224 EBC Ultimax Rear Brake Pads Toyota Altezza. EBC Part Code: DP1224. Toyota Altezza 2.0 4WD (GXE15). Perfect for the driver that wants a top quality alternative to a factory brake pad. EBC Ultimax Rear Brake Pads. DP392 EBC Ultimax Rear Brake Pads Toyota Corolla. EBC Part Code: DP392. Toyota Corolla 1.6 Coupe (AE86). Perfect for the driver that wants a top quality alternative to a factory brake pad. EBC Ultimax Rear Brake Pads. PD02KF468 EBC Front Brake Kit (Standard Discs & RedStuff Pads) Toyota Supra. Toyota Supra 3.0 Turbo. EBC Front Brake Kit (Standard Discs & RedStuff Pads). EBC Part Code: PD02KF468. Contents: Full Front Axle Brake Kit [Discs & Pads]. Toyota Land Cruiser 3.0 TD (KDJ95). PD03KR698 EBC Rear Brake Kit (Standard Discs & YellowStuff Pads) Toyota Land Cruiser. EBC Rear Brake Kit (Standard Discs & YellowStuff Pads). EBC Part Code: PD03KR698. Toyota GT86 EBC GreenStuff Brake Pad Upgrade Rear JDM DRIFT RACE. 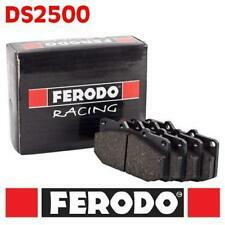 DP3628C EBC RedStuff Rear Brake Pads Toyota Celica. EBC Part Code: DP3628C. Toyota Celica 2.0 Turbo GT4 (ST185). It lasts longer; brakes better and performs quieter. EBC RedStuff Rear Brake Pads. Features EBC brake-in surface coating which conditions disc surface and accelerates pad bed-in. Toyota Corolla 1.6 Coupe (AE86). PDKF1954 EBC Front Brake Kit (Standard Discs & Ultimax Pads) Toyota Corolla. EBC Front Brake Kit (Standard Discs & Ultimax Pads). EBC Part Code: PDKF1954. Contents: Full Front Axle Brake Kit [Discs & Pads]. DP41004R EBC YellowStuff Front Brake Pads Toyota Celica. EBC Part Code: DP41004R. Toyota Celica 2.0 Turbo GT4 (ST205). EBC YellowStuff Front Brake Pads. This is not a low dust pad. Toyota Aristo 3.0 Twin Turbo Vertex (JZS161). PDKR513 EBC Rear Brake Kit (Standard Discs & Ultimax Pads) Toyota Aristo. EBC Rear Brake Kit (Standard Discs & Ultimax Pads). EBC Part Code: PDKR513. Contents: Full Rear Axle Brake Kit [Discs & Pads]. Toyota Corolla 1.6 Coupe (AE86). PDKR860 EBC Rear Brake Kit (Standard Discs & Ultimax Pads) Toyota Corolla. EBC Rear Brake Kit (Standard Discs & Ultimax Pads). EBC Part Code: PDKR860. Contents: Full Rear Axle Brake Kit [Discs & Pads]. PD08KR319 EBC Rear Brake Kit (USR Discs & YellowStuff Pads) Toyota GT86. Toyota GT86 2.0 (UK Spec) [200bhp]. EBC Rear Brake Kit (USR Discs & YellowStuff Pads). EBC Part Code: PD08KR319. Contents: Full Rear Axle Brake Kit [Discs & Pads]. Toyota Hilux (Single Cab) 2.5 TD 4WD (KUN25). PD01KF1512 EBC Front Brake Kit (Standard Discs & GreenStuff Pads) Toyota Hilux (Single Cab). EBC Front Brake Kit (Standard Discs & GreenStuff Pads). EBC Part Code: PD01KF1512. 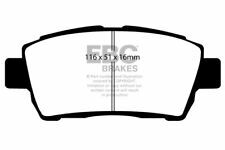 DP61657 EBC GreenStuff Front Brake Pads Toyota Hilux (Double Cab). EBC Part Code: DP61657. Toyota Hilux (Double Cab) 2.4 TD (AHT) (GUN) [150bhp]. EBC GreenStuff Front Brake Pads. There is no such thing as a no dust pad and all brake pads create more dust as they are bedding-in especially if brake discs are worn. Tarox Part Number = SP3731.112. Toyota Camry 3.0 V6 24v (VCV10). Years of manufacture: 1991 > 94. A Set of 4 Pads. Only for cars with Akebono Brake System. We will always help you to have a 100% positive happy buying experience. Toyota Land Cruiser 4.2 D (HZJ75). PD01KF1479 EBC Front Brake Kit (Standard Discs & GreenStuff Pads) Toyota Land Cruiser. EBC Front Brake Kit (Standard Discs & GreenStuff Pads). EBC Part Code: PD01KF1479. Toyota MR2 2.0 (SW20) (61691-). PD01KF1492 EBC Front Brake Kit (Standard Discs & GreenStuff Pads) Toyota MR2. EBC Front Brake Kit (Standard Discs & GreenStuff Pads). EBC Part Code: PD01KF1492. Contents: Full Front Axle Brake Kit [Discs & Pads]. DP31004C EBC RedStuff Front Brake Pads Toyota Celica. EBC Part Code: DP31004C. Toyota Celica 2.0 Turbo GT4 (ST205). It lasts longer; brakes better and performs quieter. EBC RedStuff Front Brake Pads. EBC EBC Greenstuff Sportbremsbeläge Toyota RAV 4 (1) SXA1 DP2964 5039221029649. Bezeichnung: Greenstuff Sportbremsbeläge. Satz für die komplette Achse / REG90: Nein. wenig und nicht aggressiver Bremsstaub (sehr leicht zu entfernen). PD03KR658 EBC Rear Brake Kit (Standard Discs & YellowStuff Pads) Toyota GT86. Toyota GT86 2.0 (UK Spec) [200bhp]. EBC Rear Brake Kit (Standard Discs & YellowStuff Pads). EBC Part Code: PD03KR658. Contents: Full Rear Axle Brake Kit [Discs & Pads]. Toyota Hilux 3.0 TD (AHT)(KUN26). PDKF2035 EBC Front Brake Kit (Standard Discs & Ultimax Pads) Toyota Hilux. EBC Front Brake Kit (Standard Discs & Ultimax Pads). EBC Part Code: PDKF2035. Contents: Full Front Axle Brake Kit [Discs & Pads]. Tarox Part Number = SP0770.112. Toyota Camry 3.0 V6 24v (VCV10). Years of manufacture: 1991 > 96. A Set of 4 Pads. Only for cars with Akebono Brake System. We will always help you to have a 100% positive happy buying experience. PD13KF658 EBC Front Brake Kit (GD Discs & YellowStuff Pads) Toyota MR2. Toyota MR2 2.0 Turbo (Import). EBC Front Brake Kit (GD Discs & YellowStuff Pads). EBC Part Code: PD13KF658. Contents: Full Front Axle Brake Kit [Discs & Pads]. Toyota Hilux 3.0 TD (AHT)(KUN26). PD01KF1512 EBC Front Brake Kit (Standard Discs & GreenStuff Pads) Toyota Hilux. EBC Front Brake Kit (Standard Discs & GreenStuff Pads). EBC Part Code: PD01KF1512. Contents: Full Front Axle Brake Kit [Discs & Pads]. Toyota Hilux 1.8 (YN85). PDKF2024 EBC Front Brake Kit (Standard Discs & Ultimax Pads) Toyota Hilux. EBC Front Brake Kit (Standard Discs & Ultimax Pads). EBC Part Code: PDKF2024. Contents: Full Front Axle Brake Kit [Discs & Pads].